Gold vintage ring with rose diamond.Warm color gold, the color is between yellow and rose gold. A small rose has been placed on both sides of the center stone. View more gold rings? Click here. Yellow gold children's ring set with a red coral. Gold entourage ring with sapphire and diamonds. Fine ring with a sapphire of 5 x 4 mm. With around 28 x 0.005 crt set in 2 rows of 8-sided H-SI. The size of this ring can be adjusted. View more gold rings? Click here. Gold ring with diamond.This ring is new. Smooth ring with a 0.01 crt diamond. The size of this ring can be adjusted slightly. Matching a pendant and a pair of ear studs are available. View more gold rings? Click here. Vintage bicolour gold ring with diamonds. The diamonds are set in white gold. Gold entourage ring with zirconia.Can be custom made. View more gold rings? Click here. Gold tricolor ring.3 loose rings hooked together, like the famous Cartier model. View more gold rings? Click here. Yellow gold ring.Better a new ring. Occupied with 0.05 crt diamond and 0.43 crt. Ruby. The ring size can be adjusted. View more gold rings here. Yellow gold entourage ring with diamonds set around a sapphire gemstone. Sapphire gemstones are also placed in the ring. The ring size can be adjusted. View more gold rings? Click here. Gold ring with diamonds.From the brand Le Chic. With a total of 0.25 crt. diamond. A matching bracelet is available. View more gold rings? You can find them here. White gold solitaire ring.Better a new ring. Occupied with a large 0.95 crt diamond. The diamond has a yellowish color The ring size can be adjusted. Gold ring with diamonds. Fine ring with 3 x 0.02 crt. diamond. The size of this ring can be adjusted slightly. View more gold rings? Click here. Gold ring with emerald and diamond. With 4 emeralds of 2 mm and 3 diamonds of 0.035 crt / brilliant cut H-SI. The size of this ring can be adjusted slightly. View more gold rings? Click here. 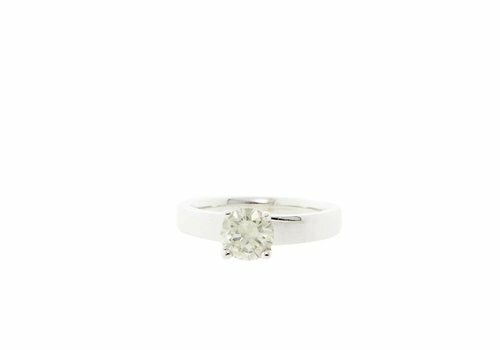 White gold row ring with diamonds. With 7 diamonds, a total of 0.42 crt. View more gold rings? Click here. White gold fancy ring with diamond of nice quality 18 krt. Yellow gold ring with a beautiful diamond in the middle and 2 diamonds on both sides. 14 color bicolour golden open fancy ring with zirconia. Dutch inspected gold. Gold ring with garnet.With a faceted grenade of 7 mm. View more gold rings? Click here. Gold ring with zirconias set in a rail arrangement. With 9 zirconias of 1.5 mm. View more gold rings? Click here. White gold vintage ring with diamant.Mooie star with 1 x 0.11 crt diamond. The size of the ring can be adjusted slightly. View more gold rings? You can find them here. Golden ring to everyone's taste! Our range of second-hand gold rings is extensive and diverse. So we have gold rings set with real diamonds but we also have a wide range of rings set with zirconia for the conscious buyer. We offer a variety of colors, such as Bicolour , Yellow , Rosé or White Gold Rings , but also gems with which the gold rings are occupied. In terms of models in which the rings are executed, there is also a considerable diversity in our collection. For example, you can opt for a fine Golden Ladies Sliding Ring , or for men for a stately gold signet ring with stylish black onyx. Within this range of different, often unique, golden rings, you will always find a beautiful Golden Ornament as desired. You are in any case always assured of a good purchase because all gold rings in our offer are officially tested and tested for purity and gold content. You get no less than 1 year warranty ! Because it can be difficult to determine the correct ring size online, it is advisable to ask us if the ring you want to buy can be customized. You can reach us by filling in the contact form or by calling 0299-653023. Sign up for the newsletter or sign up via Facebook and stay informed of all the new gold rings that we have in our offer!